Last week, the home ministry decided to permit the use of English words in the notes that officials wrote in their files. To me, that sounded like “advantage: English". The circular laid down a condition that was even more curious. English words should be written in Devanagari script. The sound system of English and the Devanagari script do not make a good match. Try writing Kozhikode in Devanagari. “Marathon" written in Devanagari reads “my ra dhan". Release and result will be written as “releaj" and “rejult". The news surprised me, as I believed that it would be seen as a political statement; that is, it would offend the sentiments of people who believed in pure Hindi as India’s national language. 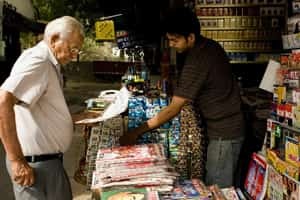 The ministry’s decision is a climbdown from the turbulent days of the Nehru-Shastri era, when the nation was divided on the issue of official language between the Hindi belt and the non-Hindi belt. The Constitution stated that in 1965, after the 15-year grace period given to English, the three words “or in English" would be deleted from its pages. Now we are putting English back. The headlines said that Hinglish was going to be official. Indian language newspapers are already following the ministry’s directive. Dainik Jagran had the following English words in Devanagari script on the day the ministry released its circular: high court, India against corruption, mayor, overall champion, dry fruits, credit card, and share bazaar. These words do not become Hinglish words just by their Devanagari spelling. Sean Coughlan wrote in BBC News Magazine that Indian words “are borrowed and reinvented to make Hinglish". Prepone, timepass, airdash, cousin brother, and eve teasing are parts of Hinglish, and are likely to be marked as such in dictionaries. The Hinglish that developed in England is not the same as the Hinglish of India. Words like balti, a form of cooking, and the ubiquitous question tag innit appeared from the intermingling of different immigrant groups and native speakers in the UK. The whole exercise represents a recognition by the ministry that effectiveness of communication is vital, and if necessary, a mix of two or more languages should be encouraged. The writing can be as informal as our normal conversation. The message must easily get across. A similar situation, on a smaller scale, was reported by The Scotsman. Here, too, the problem related to the effective use of language, and the authorities took a similar, bold decision. In the region of the Lothians in Scotland, doctors found that patients were unable to understand important health messages when they were written in a formal style. As with Hinglish in the ministry in Delhi, the doctors decided that patients should get messages in text-speak and slang they are familiar with. About 23% of the area’s population is functionally illiterate, with meagre reading and writing skills. These people tend to fall ill easily, and doctors have decided to speak to them in their language. If slang conveys the message best, then use the slang. Besides slang, the doctors use known abbreviations and colloquialisms. The National Health Service has invited Edinburgh University to join its officials in developing a programme to improve communication between health officials and the public to ensure that help reaches everyone who needs it.